Version 5 of Wild Apricot has been scheduled for release starting in early May –please see Software News - Version 5 Upgrade: The finish line is in sight – for details about the upgrade process. Let's take a look at what’s waiting for you in Version 5. Version 5 was designed and developed to address the most common requests we have been hearing from our users for years: easier and more flexible site design, and more modern website themes. Consequently, much of the Version 5 release is focused on the new website builder module, aka CMS – content management system – used to set up and customize website pages. And while we were at it, we addressed a number of other issues raised by our clients. In total, Version 5 will address more than two dozen specific wishlist threads. You can view the complete list of wishlist threads addressed in Version 5 here. Wild Apricot’s new website builder represents a complete redesign of the entire website management process. Our guiding philosophy was to make site design more flexible - while making it easier to use at the same time! Let’s take a look at how we've applied this philosophy. 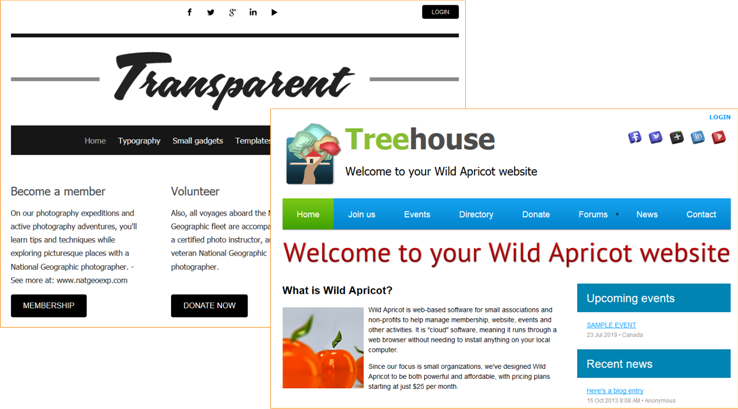 Previously in Wild Apricot, all pages shared the same layout, which was inherited from the website theme. Changing the page layout was a complicated process involving theme overrides and CSS, typically requiring the services of professional web designers. With Version 5, pages can have different layouts, and page layout can be modified using a graphical editor. Pages now inherit their layout from page templates, which you can modify using the same tools you use to design pages. Within the template, you can divide the page into different content areas, and add content such as logos, taglines, menus, and contact info. Any content you add to the template will automatically appear on all pages that are based on that template. 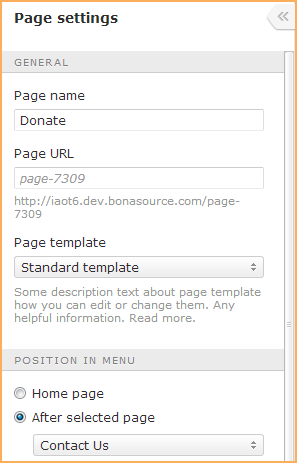 Page headers and footers now form part of pages templates, and are no longer set up separately. Each page can be based on a different template, and multiple pages can share the same template. You could, for example, use one template for public pages, another for member-only pages, and a separate one for landing pages. 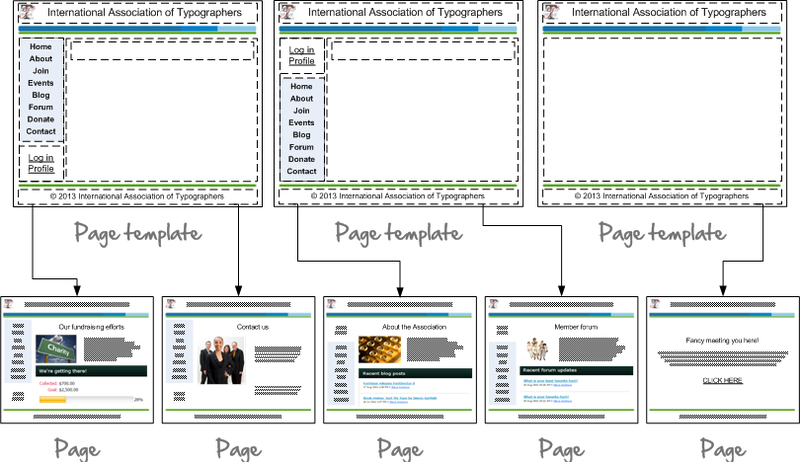 Using page templates allows you to promote consistency between pages while providing flexibility. In previous versions of Wild Apricot, page management took place on a different screen from page design, forcing you to jump back and forth between the two. In Version 5, page management and page design both take place on the Site pages screen. From here, you can add, modify, delete, or reorder pages. When you create or modify a page, you can control various aspects of it by changing its page settings. Through page settings, you can control its menu name, page URL, page template, menu position, access restrictions, and meta-tags. 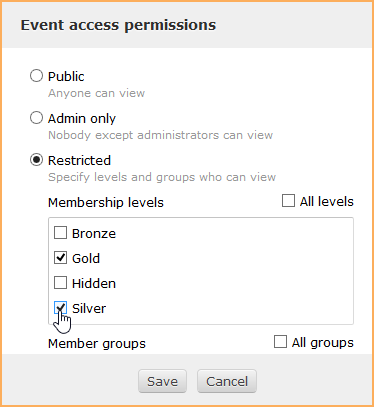 Restricting access to a page previously meant creating a restricted access section page then dragging the pages to be restricted under the RAS (Restricted Access Section) page. Now, restricting page access simply involves choosing the access level from the page settings. 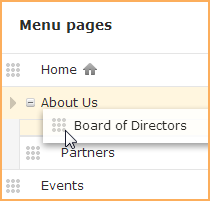 Within the page settings, you can set the position of the page within the site menu. Using the Not in menu position setting, you can now exclude a page from your site menu, like a landing page for example. 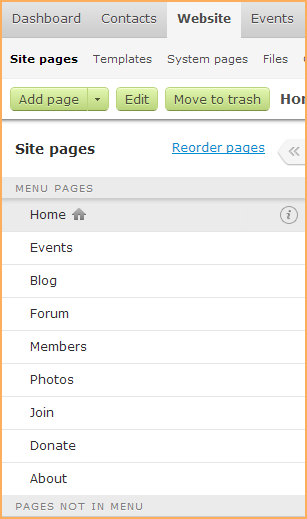 You can also control the order of pages in the menu from the Reorder pages screen. From there, you can drag and drop pages to the desired location within the menu and make a page a subpage of another page. The previous limit of 3 menu levels has been dropped. You can now have as many menu levels as you want. Previously in Wild Apricot, you could undo only your most recent page revision. Now, each time you make a change to any page or a page template, a separate version is saved. This protects you against someone unintentionally messing up a page. 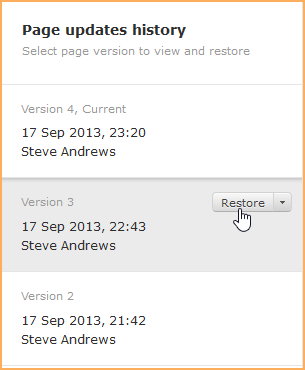 You can view the previous versions of any page or page template, and restore any version. Deleted pages can also be restored, protecting you against accidental deletions. Prior to Version 5, once you deleted a page, it was gone. Restoring it from our backups was a complicated and time-consuming process. Now, when you delete a page or template, it is moved to the trash. From the trash, you can preview the deleted page or template, and restore it, or empty the trash. To protect you against browser crashes, Version 5 automatically saves a copy of the page or template you are editing every 10 seconds. If your browser crashes before you have a chance to save your changes, the system will prompt you next time to resume where you left off. In Version 4 of Wild Apricot, page design was somewhat restrictive, and a bit complicated. First, there was the distinction between content pages and functional pages. Functional pages displayed specialized functionality like blogs and event calendars, while content pages were used for custom content such as text and graphics. But you couldn't combine these two types of content. If you wanted to display a membership application form on a page, then that's all the page could display. Now, the concept of functional pages is gone. All pages can now display a mix of custom content and dynamic functionality. For example, you can create an event calendar page consisting of an event calendar gadget, a content gadget displaying your own text and graphics, and a slideshow gadget showing pictures from past events. In Version 5, all content is added as gadgets. A gadget can be used to display custom content such as text or a picture, or to add dynamic content – basically, everything that used to be available only as a functional page. In addition to the kind of content you're used to adding as functional pages, you can now insert gadgets to display Google maps, slideshows, sitemaps, and social media links, among other new functionality. Even your site menu and login fields are now added as gadgets. The gadget you'll be using the most often is the content gadget, used to add text, graphics, tables, and any other custom content you choose. To provide precise control over the positioning of gadgets, we have greatly expanded the use of layouts. In Version 4, you could insert a layout to split a content page into multiple rows and columns. In Version 5, you can add any number of layouts to a single page or page template, allowing you to create multiple sections, each with its own combination of rows and columns. The content editor that you used to modify content pages In Version 4 is now used to modify content gadgets. Though the content editor has been significantly enhanced, existing users will find most of the functionality familiar. One significant enhancement that provides even more control over positioning of content is addition of layers. Existing users might remember using layers to position text and graphics when setting up their page header or page footer. With layering now available from the content editor, you can position content anywhere you want and even overlap other content. Another important enhancement is the ability to format links as buttons. Previously, you could only link text or pictures. While formatting a link, you can choose from a number of theme-specific button styles. If you've formatted a chunk of text just the way you want, you can now copy and paste the text style or text attributes to another chunk of text, or to an entire paragraph. You can tweak the HTML for content gadgets as you did for content pages, but now using an enhanced HTML editor. 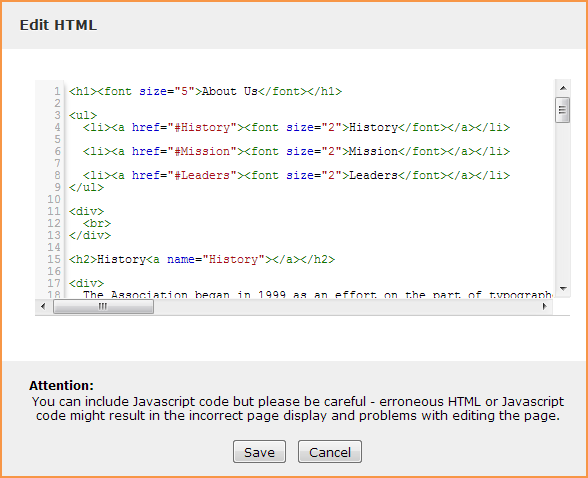 The new HTML editor features line numbers, autocomplete, and tag matching, while retaining code structure and indenting. Four new website theme sets (27 new variations in total between them) offering a more modern look and feel, have been added. Some of the new themes feature simple, clean layouts that makes them a good starting point for those who want to completely customize their Wild Apricot site. This is not the end but just the beginning – the changes we have made in Version 5 will make possible for us to deliver many more website themes much faster from now on. In fact, our plans for this year include a whole bunch of additional themes! Though the focus of Version 5 is on the CMS changes, other aspects of Wild Apricot have been enhanced as well. Before Version 5, navigating to a particular admin screen was often a two-step process: click the module tab then click the option within that module. 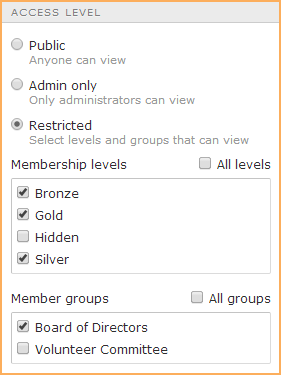 Now, you can jump to most admin screens simply by selecting a pull-down menu option. A number of enhancements have been made to the events module. 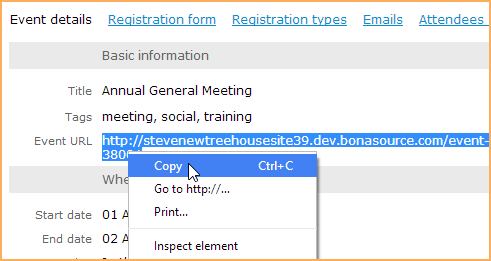 So you can provide people with a direct link to details for a particular event, a URL is now available for each event. You can copy the event URL and share it through social media or email. 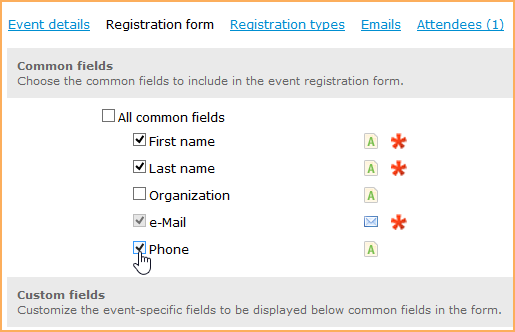 For more control over what appears on the event registration form, you can now choose which common fields appear on the form for each event. 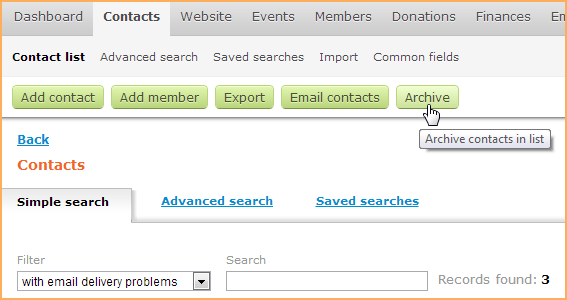 And finally, you can now archive a filtered list of contacts from the Contacts module. This is one of the things we really wanted to address in Version 5 – but eventually had to make a hard decision to include only in a limited way in this version to avoid further delays – and roll out the remainder in the subsequent releases. Out of the box, new themes will scale better on mobile devices than all the existing ones. Furthermore, an option can be turned on – through code – to make them even more responsive, but this feature has not been fully tested and that's why we are not enabling it by default. You will definitely see lots of other mobile-focused enhancements rolled out later this year, from further improvements in theme responsiveness to dedicated mobile apps to access specific backend functions like searching the contact and member database and checking people in at events. 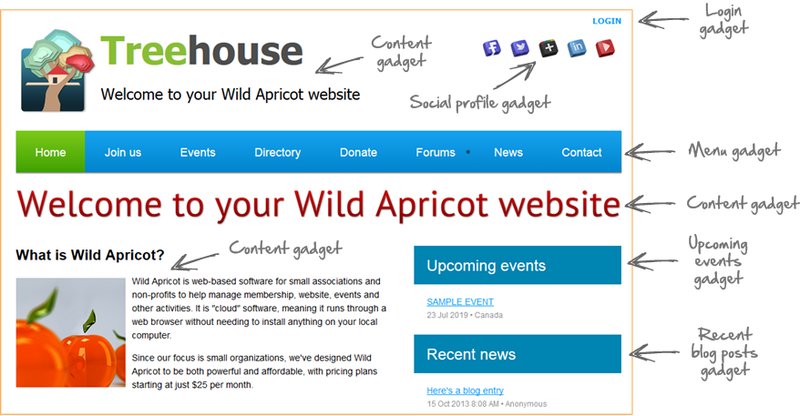 As you can see, Version 5 brings significant improvements to the way you set up and customize your Wild Apricot site. To help you master the new version, we have scheduled a Version 5 Overview webinar for April 30th (sign-up form). This will offer a video overview of Version 5 followed by a live Q & A session. Please also read the Software News blog post describing the upgrade process. We hope you will agree that Version 5 was worth the wait! Wild Apricot - you are amazing! I am so glad I found your service. Thank you for continuing to make running my business so easy! Since transferring my events and memberships to your server, I have increased enrollments in all my classes. I am looking forward to the enhancements in Version 5! Thanks for all the hard work! You guys are doing an awesome job. I manage two WA sites and completely rebuilt one of them from the original host to WA. Great CMS system currently and I'm looking forward to the improvements. Just to let you know, your support department is doing a terrific job. I did software development for 30+ years and know how hard it is to get it right. You have gotten it right. You guys are great! One of the best customer-oriented tech companies anywhere. Looking forward to version 5 for all my clients. Checking people in at events with a mobile device?!? Sweet! You guys rule. Nicole, Jan, Kim - thank you for your kind words! Craig - yes, it should be pretty useful but notice that mobile check-in for events will not be in 5.0 but rolled out a bit later. Can members insert images in blog postings? (I know that Administrators can.) This was a primary reason I ceased using Wild Apricot for one of my organisations. Grateful for website template flexibility. But content with current structure. It's essential functionality that concentrates my mind. Allan L - no, we haven't have progress with images in blog posts. This is in our focus for this year, but I cannot promise if it fits there. Wow!! You guys continue to amaze me. Thank you so much for listening and working with your clients to help us look great no matter our association size. One of the challenges I continue to run into is the inconsistency in the formatting tools/settings throughout our site. Will this be addressed in the upgrade? If so, I will be a very happy customer. When is event data going to be accessible from the API? I've got a lot of ideas of things I'd like to work on if that data was available. Let me know! Looks amazing! I use WA for my site and two for clients, and can't wait to work on them in Version 5! Hi guys! Love your software! Just wondering what will become of the Forums? I don't see any mention in the new release and it's not highlighted in your Tour. I know this was a 3rd party integration. Can you please share the status? As Master Scheduler for Half Moon Bay Yacht Club, I really hope that regularly occurring events could be entered ONCE rather than having to enter it over and over and over and over and over. For instance, if there is a Tin Can Race every Saturday morning between May 1 and September 30, I'd like to be able to enter it once, setting parameter dates. I sure hope that shows up in Version 5! We absolutely LOVE you guys! You've made our business possible. Thank you for being so amazing!!! Can't wait to see all the new features. I'm embedded the Member Directory widget in another website. Will this update affect the functionality? These changes look great. Thank you for addressing some of these needs. Will the new web design templates include those with a responsive design to optimise viewing for computer monitor, tablet and mobile device? Recurring events would be great. Also the ability to create "event templates" that could be customized without deleting the template would be great as well. 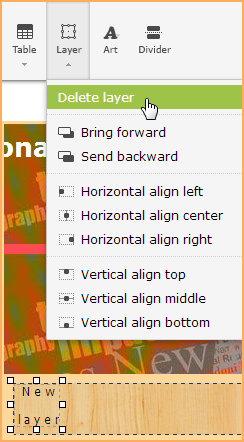 The increased options for layouts are great. Have you added the ability to tag blog posts? That's something I'd really like to see. One thing we would really like is the ability to make a mailing list for all our [paid/whatever] members such that any give member can use it to sent to the list. We have meetings every week, and a different member (not a site admin) organizes the meeting. We would like our meeting leaders (members) to be able sent to a standard email like members@ourdomain.com, without having to maintain a separate list server. Love the updates! Any chance we'll get the ability to add recurring events? As a yacht club with a sailing school, it would make it a whole lot easier for setting up registration for our racing series and our sail school sessions. Thanks! Good work WA Team, looking forward to the fresh new features! Bridget, iBiz247 (cool name :-) ), Jim - thank you! Matthew - no changes to forums in version 5 but we have a number of enhancements planned for subsequent releases. And forums are our own, no third party code is used. Cynthia, Kate, Jenn - recurring events are not part of the version 5 but we have designed new functionality to deal with these and it is in our development pipeline for the following releases. Lee - your embedded member directory should not be affected. Jackie - we are making some steps toward responsive design in new themes included in 5.0 but its just a first step. We are working on much more stuff related to this for follow-up releases. Robert - understood and this is on our roadmap. And once again, those of us that have been begging for YEARS for a simple transaction confirmation page in which to insert conversion tracking code so that we can manage our advertising, have been ignored. THIS IS BASIC FUNCTIONALITY for any e-commerce site. Pathetic that you can't figure it out...or simply don't care enough to help us out with this. Word Press and WHMCS are much more e-commerce friendly, & allow for ACCURATE CONVERSION TRACKING, for anyone who spends any amount on advertising. Marc - we have many thousands of people using the system and there are many perspectives on what is 'basic functionality' and what our priorities should be. We use our wishlist forum (http://community.wildapricot.com/8/ShowForum.aspx ) as a key tool to guide our roadmap - right now our focus is on those threads that have 10 or more people supporting the request. Conversion tracking code has been brought up but so far we haven't received enough input to figure out a common solution or prioritize it for our roadmap. If you are willing to help us help you, I would really appreciate if you could post a detailed use case for this on the forum and I will give it my personal attention. Please tell me that we can now have discount codes for events rather than the coupons? Michelle - sorry, no, not part of the version 5.0. It is in our design pipeline but no specific timeline yet. Scott - you mean supporting installment payment? This is on our roadmap but has not collected enough support yet for us to start the design work and consider scheduling it. So not until the end of 2014 - at least - sorry. So how do we get "installment payments" higher on the list? One of my clients Active Essentials, runs a gym and would love to see this added so that there aren't so many different gym memberships packages. Makes it confusing to potential customers. Also wondering if I will be able to customize that webpage because it doesn't match the colours of the rest of the website. No template formating allowed and grey text is not our favourite. Can hardly wait for the new version though....sounds great! We do have instalment payments in our 2014 roadmap, but we haven't started any analysis yet on it. To help us with the better result, I would appreciate if you put your notes into our wishlist - http://community.wildapricot.com/12868/ShowThread.aspx - not just that you want it, but what are your scenarios and example of usage.